ADA Bathroom Requirements | Is ADA Compliance Necessary? Is it Necessary to Follow ADA Compliance Rules in My Home? Many of our customers have asked if they have to follow the rules of ADA Bathroom Requirements when adding a shower for a handicapped loved one in their home. The short answer is no and we will explain why. At the same time, knowing the guidelines may be helpful. There should be a knee clearance of 27 inches high, 30 inches wide, 11 to 25 inches deep. You also need a clear floor space and insulated pipes under the sink. It is so painful to see our loved ones lose mobility. Painful for us but even more so for them, and humiliating too. If you have a family member that’s going through this now you might consider remodeling your bathroom. Or even doing a tub to tile shower conversion. As one of my customers recently said – “it’s the best gift that I can give to my mother right now”. "The best gift that you can give a loved one." One of the comments Ron has enjoyed hearing more than any other over the years is – “finally I have my independence back”! When we have to rely on others to get us in or out of every shower it can be humiliating. Adding a zero threshold, curbless shower can provide a loved one the freedom to care for themselves. 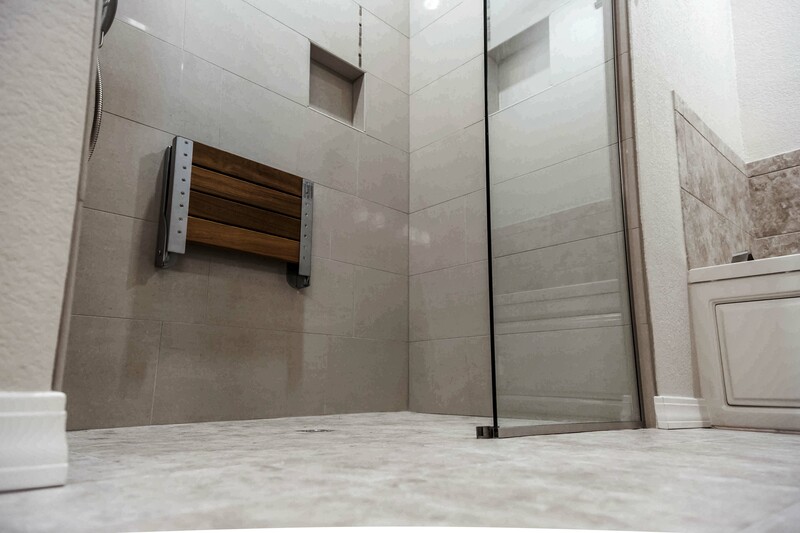 So many of our customers say going with an ADA bathroom or curb-less shower was one of the best investments that they ever made in their home. Especially if you live alone, a fall in the shower can be devastating. Aging-in-place is a term we are hearing a lot about right now. This is one reason why people are so interested in following ADA Bathroom Requirement and having a zero threshold shower installed. Many people would like to stay in their own homes for as long as they possibly can so they’re making changes to their home in advance, planning for possible future infirmities. Smart? Very! Consider this – 87 percent of adults age 65+ want to stay in their current home and community as they age. Thinking through a remodel that will take you into your advanced years might include a roll-in shower, grab bars, non-skid tile. It might also include having to enlarge a bathroom to accommodate a wheelchair or a walker. What about adding a step-in tub or a curb-less shower? Without getting into the age-old shower vs bath debate – these are your options for aging in place if you still want to be able to take a hot soak in a tub. When we’re young we think nothing of stepping in and out of a tub or shower. But, it can become a risky business as we get older and lose our balance and or mobility. Some people want to continue to use a tub. In that case, there are now some interesting options in tubs with doors that seal tight when filled with water. Like this one on Amazon that also has whirlpool jets. Are you more of a shower person? 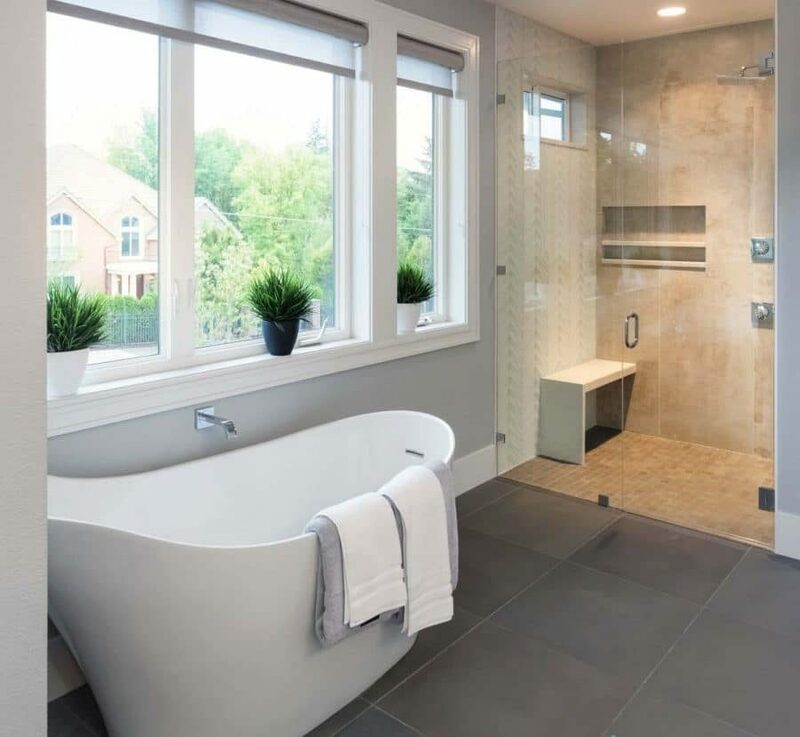 If you are more of a shower person than you may want to consider removing your tub entirely and adding a roll-in or a curb-less shower. Even a small bathroom can accommodate this type of shower. We have even converted medium sized closets into handicapped accessible showers. If this is something you would like to look into then give us a call, or drop us a note with some pictures of your space. We can give you an idea of cost and help you get started with your project.